The Special Flora and Fauna Reserve Tivat Saline (Tivatska solila) in Montenegro is in the so-called southernmost fjord of Europe and is under pressure of the fast-growing tourism businesses in the region. Two Dutch volunteers went there to map the presence of mammals. You can do the same. Volunteer! Not much is known about wild mammals in Montenegro. Also, only a few biologists in Montenegro actively study wild mammals. Both aspects hamper effective conservation of wild mammals in Montenegro. Knowledge and conservation are needed because the pressure on land and wildlife in Montenegro is increasing due to the economic growth in the country. One of the areas under pressure is the Ramsar site Tivat Saline, in the Bay of Boka Kotorska. 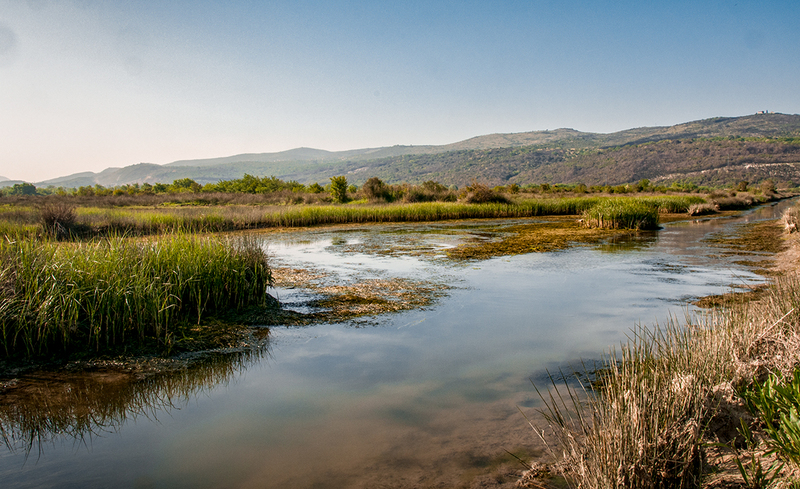 In the forested rocky and partly urbanised coastline of the bay, Tivat Saline is the only flat wetland area, a salt marsh. Several decades ago people used to collect salt here; the old dykes and dams are still visible. Now it is a protected area and due to its diverse salt-tolerant vegetation, it offers an important resting and foraging site for migrating wetland birds. To be able to manage the area in a proper way, the management of the reserve want to know what kind of mammal species are present in the area. Mapping mammals is not an easy task and therefore the local biologist Marina Radonjić asked the Dutch Mammal Society for help. In April 2018, Bernd-Jan Bulsink and Chris Driessen drove to Montenegro. In the trunk of their car, they carried a load of live traps, camera traps, and mist nets. They spend five days in the reserve surveying mammals. 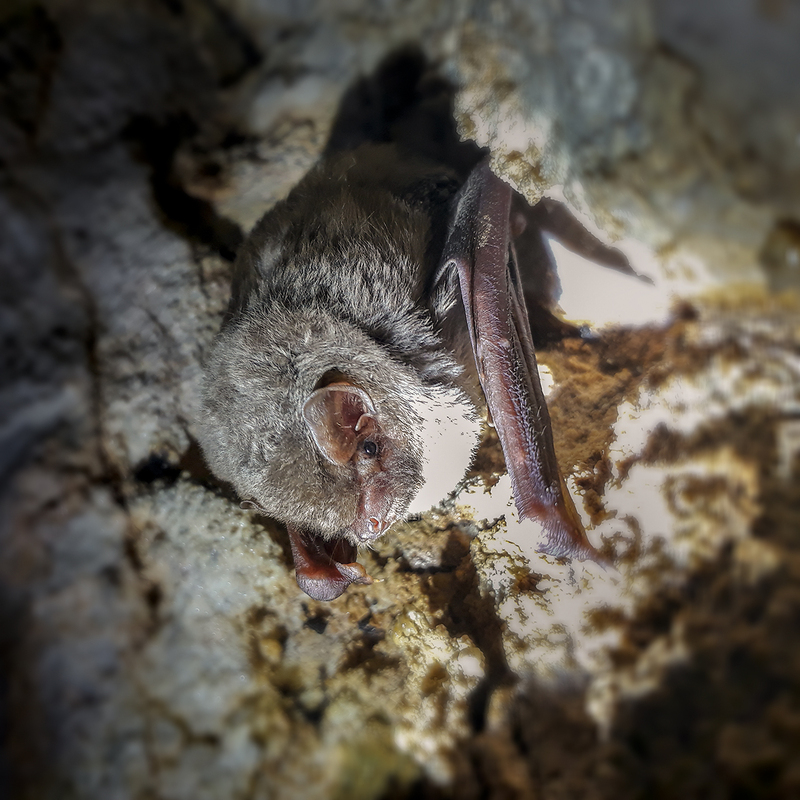 In the fortresses around the bay, they found several groups of Greater horseshoe bat (Rhinolophus ferrumequinum) and Lesser horseshoe bat (Rhinolophus hipposideros). Other species, like Greater mouse-eared bat (Myotis myotis), Lesser mouse-eared bat (Myotis blythii), and Schreibers’ bat (Miniopterus schreibersii) were present too, but they were in torpor. Possibly, these males were waiting for the females to arrive. Based on the piles of bat excrements, these fortresses are probably also used by hibernating bats. Also seen were a Badger (Meles meles) and a Beech marten (Martes foina) but both were seen outside the reserve, near to the village Škaljari. The number of small mammal species in the reserve was somewhat disappointing. The cause could be the time of year. Usually, small mammal populations are low after winter and increase in the course of the year. It is possible to carry out more trapping sessions in the reserve. The mammal survey will continue till October 2018. If you are interested in helping Marina Radonjić, you can contact the Field Study group of Dutch Mammal Society for more details. Apodemus sylvaticus, badger, Balkan, beech marten, Canis aureus, Crocidura suaveolens, fox, Golden jackal, Greater horseshoe bat, Greater mouse-eared bat, Herpestes auropunctatus, House mouse, Kuhl's pipistrelle, Lesser horseshoe bat, Lesser mouse-eared bat, Lesser white-toothed shrew, Long-fingered bat, Martes foina, Meles meles, Miniopterus schreibersii, Mus musculus, Myotis blythii, Myotis capaccinii, Myotis myotis, Pipistrellus kuhlii, Ramsar, Rhinolophus ferrumequinum, Rhinolophus hipposideros, Schreibers' bat, Small Indian mongoose, Tivat Saline, Vulpes vulpes, Wood mouse. Bookmark.